I wanted to get a Cisco book in order to prepare myself for the CCNA exam. I checked previously on internet some books for that purpose and i found one called “CCNA Study Guide” by Richard Deal distributed by McGraw-Hill. I went to the FIL (Feria Internacional del Libro aka International Fair Book) and i got to the McGraw-Hill stand and what was my surprise that they didn’t have any book in english. I remembered that Amazon.com sends books to Mexico without any special charge (i. e. import taxes), so I decided to put my order. 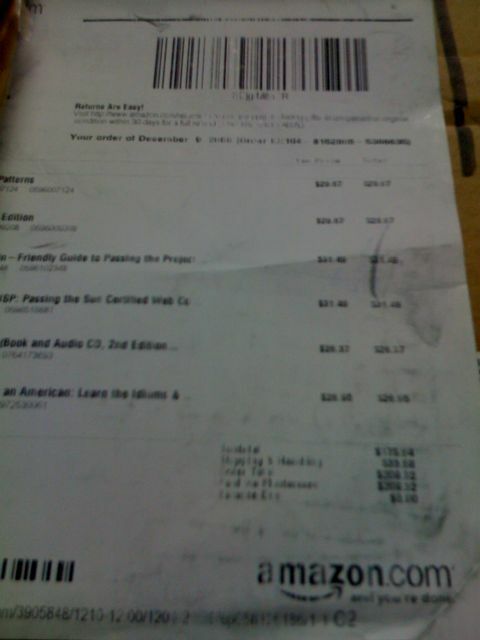 Some of my co-workers wanted some books as well, hence the shipping cost was around 5 dollars per book (8 books ordered). Around 1 or 2 days later after i put the order, i received an email saying that the books would be sent in two parts: first part would contain my CCNA book plus another one of my co-worker. Second part would have the rest of them. That was the story about my book, the odd thing is that the package that arrived today, it was shipped two days after the other. My book should have arrived first, shouldn’t it?